Although many people love mouthpieces with all the bells and whistles, I tend to be drawn to the devices with a simpler design, as long as they work. I had high hopes for SnoreMeds. I should actually say my bank account had high hopes for SnoreMeds. I liked that it looks simple and easy to clean, but its low price definitely made it shine a little brighter. 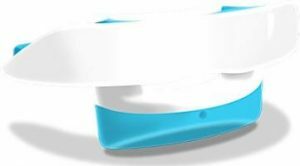 The company even offers a loyalty program, so I really hoped this mandibular advancement device (MAD) would be an effective snoring solution. Unfortunately, this was not a winner with either of us, and didn’t come close to making the recommended mouthpieces list. 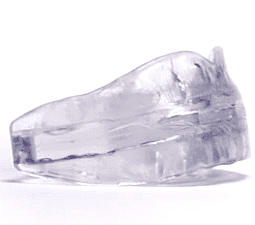 (See how SnoreMeds compares to other mouthpieces HERE). Front air hole allows you to breathe through your mouth effortlessly while you sleep. Material used is BPA- and latex-free, and it is cleared by the FDA. This device boasts an affordable price, as well as a loyalty program. Boil and bite method allows you to get a more tailored fit in the privacy of your own home. Backed by a 45-day warranty. Device is easily cleaned with toothpaste and toothbrush. Lifespan can be as short as 3 months. Device is invasive in your mouth. Though SnoreMeds is very reasonably priced, I found it to be very uncomfortable and not effective for stopping snoring. Overall I do not recommend this mouthpiece. The goal of all MADs is to keep the airway free of obstruction. SnoreMeds is no exception. 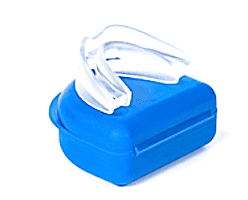 These anti snoring devices are designed to hold your lower jaw forward, which is supposed to prevent your tongue from collapsing into your throat so soft tissues are not close enough to vibrate. SnoreMeds is made of a hypoallergenic thermoplastic material that is BPA- and latex-free. Note that the material has been cleared by the United States Food and Drug Administration, but the product itself has not been. This device is available in two sizes, one of which is a smaller variety that is made for women, as it has a narrower design and deeper bite. This device needs to be fitted before wearing by using a boil and bite method. This allows it to form to the unique shape of your mouth. This is supposed to make it more comfortable and effective. SnoreMeds does have an airflows hole in front to allow you to breathe through your mouth. So, if you have nasal polyps, sinuses, a deviated septum, or just (really bad) allergies (like me), you will appreciate this feature. If any of those mentioned concerns apply to you, it is vital that you choose a mouthpiece with an air hole to allow for deep breathing. Although SnoreMeds are available in single, double, and value packs there are not any packages with both varieties included. So, I had to order the original for me and the small for my wife. I’m not sure why this wouldn’t be an option. I was really disappointed that I couldn’t order both sizes in one package. The fitting process was fairly simple. We have done this several times, so we are pretty used to it. The most challenging party of the process is determining how far to extend your lower jaw forward. I have done it enough times to usually get it right on the first try. However, if you don’t, you can reheat the device one more time. That night, my wife actually said her mouthpiece felt pretty comfortable. She said it could have been a little more streamlined, but it certainly was not the bulkiest one either. I thought it maybe there was hope for this one. It is not often that she offers positive feedback right away. On the other hand, I wasn’t so excited. Mine just felt off, and it was rubbing against my gum weird on the right side. I also felt like it was a little invasive. When our dog woke me up for a bathroom break in the middle of the night, the first thing I heard was my wife snoring away. Her mouthpiece was still in, but it wasn’t doing much of anything. My gum was sore where the mouthpiece was rubbing. I decided to leave it out for the rest of the night, and I had to put a pillow over my head to block out my wife’s snoring to fall back asleep. In the morning, my wife complained about being tired. I told her it was because she was snoring all night and did not get quality sleep. We decided to both try refitting our mouthpieces again. Maybe I could fix the rubbing problem, and she was going to need to extend her jaw a little more forward to have any hope of getting through a snore-free night. The second night was not much better. Refitting did not stop the rubbing. As for my wife, she no longer raved about the mouthpiece being comfortable. However, her snoring was a little better than usual. After the third night, we were both ready to throw in the towel. Her snoring was not getting better, but her jaw was sorer. My gum was rubbed so raw that I barely wanted to eat. SnoreMeds was not the effective solution I had hoped for. Although the price is right, it could have been free and I would not have found it any more attractive. I still cringe at the thought of how bad my gum was rubbed raw on one side. 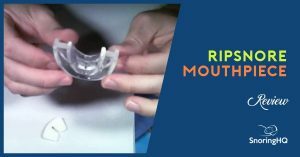 It could be a snoring solution for you, but it definitely did not deserve a place on our list of recommended mouthpieces. Zyppah or ZQuiet are products I would recommend for anyone looking for an MAD. The design is extremely comfortable and it actually works. For my overall mouthpiece pick (not a MAD), check out Good Morning Snore Solution. It’s a little more money, but well worth it to have a product that you will actually get your money’s worth out of.